You can order Voltaren Emulgel Extra Strength from YouDrugstore at a low cost. 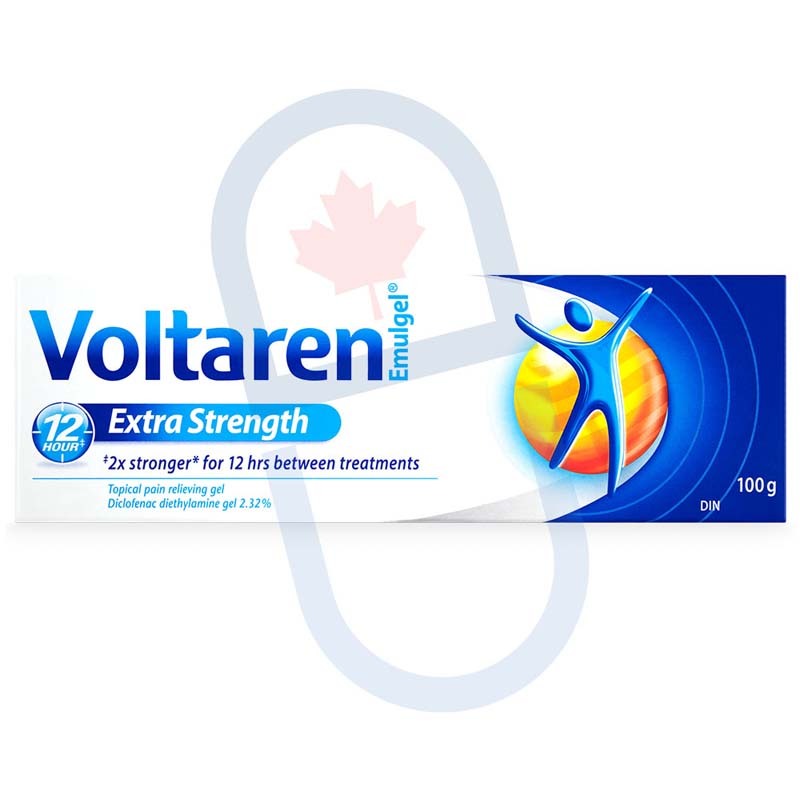 We are an online pharmacy based in Canada, which means you can buy Voltaren Emulgel Extra Strength 100 g from YouDrugstore for the same cheap price Canadians pay. Simply click on register at the top of this page and fill in your information, or give us a call toll free at 1-855-968-6337 to place your order. After we have received all of the necessary information our staff of professional pharmacy technicians will ship your order out within 48 hours. When you purchase from YouDrugstore you get your order shipped to you for an affordable shipping cost. We even provide free shipping on any order over $100. Order today from YouDrugstore and get powerful, penetrating, affordable relief from pain. Voltaren Topical Gel contains Diclofenac, a nonsteroidal anti-inflammatory drug (NSAID). Diclofenac reduces inflammation and pain in the body by reducing hormones causing them. Voltaren's Diclofenac Topical gel is used to treat joint pain in the knees, ankles, feet, hands, elbows and wrists caused by osteoarthritis. When should you use Voltaren Emulgel Extra Strength 100 g? 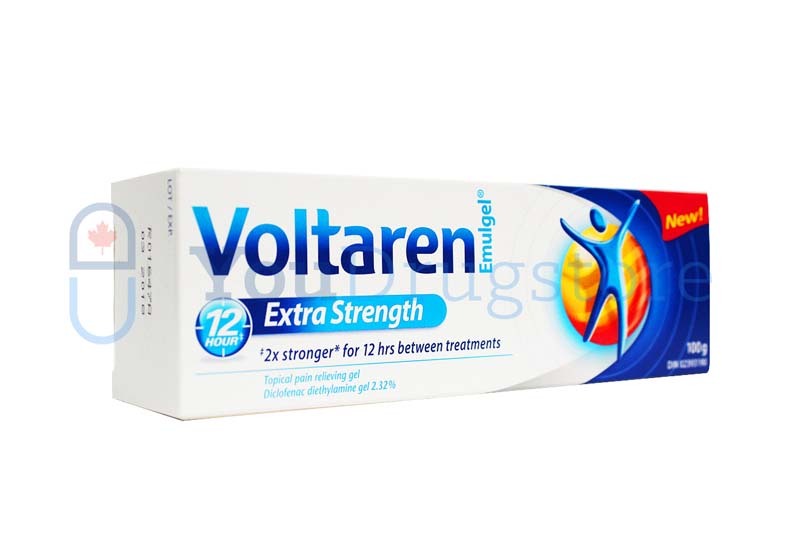 Voltaren Emulgel Extra Strength is recommended for those with sprains and muscle injuries. Use Voltaren Emulgel Extra Strength as needed when your pain is present. Generally, you should use Voltaren Emulgel Extra Strength every four hours to control your pain. If your pain lasts longer than a week you should contact your doctor. To properly apply Voltaren Emulgel Extra Strength rub a thin layer into to the affected area, then be sure to wash your hands. The only time you should not wash your hands after applying the gel is if your hands are the area that you are treating. Do not apply Voltaren Emulgel Extra Strength topical to open wounds. If your doctor has recommended you use Voltaren Emulgel Extra Strength in a particular way always follow his or her directions exactly above all others. What are the side effects of using Voltaren Emulgel Extra Strength 100 g? Side effects are considered rare when using Voltaren Emulgel Extra Strength. That being said, it is still good to familiarize yourself with the side effects you may experience when using Voltaren Emulgel Extra Strength topical treatment. Typical side effects of using Voltaren Emulgel Extra Strength include a burning or tingling sensation when the treatment is first applied, itchiness, gas, dryness of the skin, acne, upset stomach, heartburn, and a runny nose. These are common side effects that sometimes occur as your body adjusts to the medication. Call your doctor if any of them are severe or disruptive to your daily functioning. Even more rare (but serious) side effects include trouble breathing, coughing, severe headaches, tightness in the chest, eye pain, and blood in the urine. Be sure to contact your doctor as soon as possible if you experience these more harmful side effects. Why is Voltaren Emulgel Extra Strength 100 g recommended to treat pain? 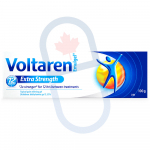 Voltaren Emulgel Extra Strength is one of the most popular muscle and joint pain topical gels used in Canada. In fact, Voltaren Emulgel is a leading brand name medicated product, trusted and safe for the treatment of muscle and joint pain. Voltaren Emulgel Extra Strength is double the strength of Voltaren Emulgel Original, providing strong, triple action treatment. Voltaren Emulgel Extra Strength contains diclofenac, a generic drug that helps by relieving pain, reducing inflammation, and boosting your body's natural healing process. The other ingredients in Voltaren Emulgel Extra Strength all work together to help deliver the medication directly through your skin. Who can use Voltaren Emulgel Extra Strength 100 g? Voltaren Emulgel Extra Strength is safe for nearly everyone; however, those under the age of 14 years old should avoid using Voltaren Emulgel Extra Strength unless otherwise discussed by a doctor. This is because the safety of Voltaren Emulgel Extra Strength in children under 14 has not been officially established yet. You should also tell your doctor if you are pregnant or breastfeeding before using Voltaren Emulgel Extra Strength. Never use Voltaren Emulgel Extra Strength if you are allergic to it or any of its ingredients.